Spring into savings on Nintendo eShop with the Super Spring Sale! 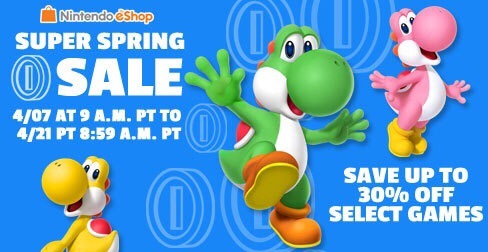 Save up to 30 percent off select games in Nintendo eShop starting at 9 a.m. PT on April 7 until 8:59 a.m. PT on April 21. Remember: Purchasing items from Nintendo eShop is an easy way to earn points for the new My Nintendo rewards program. Just make sure your Nintendo Network ID and Nintendo Account are linked prior to making a purchase. Visit https://my.nintendo.com/ for more information.